Darius Jedburgh: We're all terminal, Millroy. Even middle management. 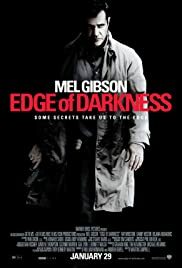 Q: Is "Edge of Darkness" based on a book? I'm the guy that's got nothing to lose and doesn't give a sh*t! ***SPOILERS** After an eight year self imposed exile from the movies, in him not staring in them, Mel Gibson is back older grayer and a bit weather beaten, from his wild exploits off the screen, as Boston police detective Tom Craven: A man who's craven actions end up toppling not just a major US Government defense contractor but an extremely arrogant and corrupt United State Seantor as well. It's when Craven's 24 year-old daughter Emma, Bojana Novakovic, fell ill from drinking a glass of spiked, with a fast acting poison, milk and, in the process of Craven taking her to the hospital emergency ward, is then blown away at the front door by an masked assassin that Craven's mind suddenly snapped! At first thinking he, not Emma, was the target of the assassins bullets Craven uncovered that it in fact was Emma that the killer was after. Working for the highly secretive Northmoor Defence Plant outside-in Northampton Mass.-of Boston Emma together with a number of co-workers uncovered a secret operation at the plant that was producing nuclear material and selling it to the highest bidder that may well have included terrorists groups like Osama Bin-Laden's Al-Qeada! It's when Craven gets in touch with one of Emma's friends who also worked at the plant Melissa, Caterina Scorsome, that the truth finally came out, in a DVD she gave him, to not only his daughters death, or murder, but the reason behind it! Emma was about to blow the whistle on the whole illegal operation and had to be eliminated before she exposed it to the public! Melissa herself was also offed minutes later after telling Craven all this in a out of the blue hit-and-run by one of the plants hired assassins! In a series of extremely brutal and gut crunching actions Craven slowly uncovers a web of intrigue secrecy and illegal arms dealing that's going on at the Northmoor Defense Plant that lead straight to its CEO Jack Bennett, Danny Huston. Cravan on what is best describe as a suicide mission doesn't seem to care at all what happens to him only wanting to get to those who murdered his daughter and exact his kind, brutal and sadistic, of justice on them! ***SPOILERS*** Getting help from an unexpected source the company clean-up man Jedburgh, Ray Winston, Craven uncovers the fact that both Bennett and Massachusetts United States Senator Jim Pine played by Damian Young, looking like the real Senator John Kerry of Massachusetts but with a much shorter haircut, are involved in this corrupt arms dealing. If that's to continue it can can lead to a nuclear attack on America that would make 9/11 look like not just child's but kindergarten play! In the end Bennett as well as the hood he had under contract a Mr. Moor, Denis O'Hare, who murdered his daughter Emma get exactly what's coming to them from a vengefully and out of control, in the gruesome and cold-blooded way he did them in, Tom Craven. As for the "Good" Senator Pine he gets his the old fashioned way in the way that things are done in his type of corrupt and sleazy politics the world over. By the person he trusted and was most close to him who ended up cleaning his clock where it won't be working for him any more!